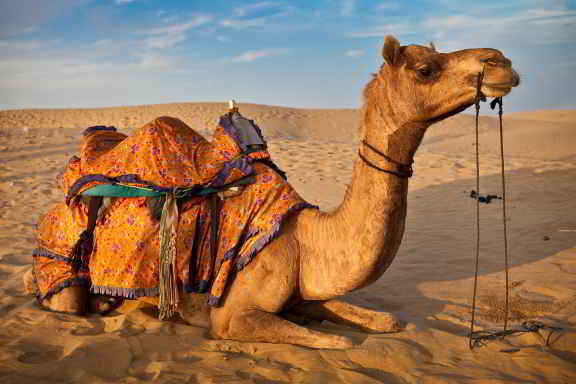 The Thar camel safari in Bikaner city offers one of the amazing experiences. Most of the tourists enjoy the camel ride, though it can be quite a bumpy one. With due time, people become accustomed to the sway of the ride. It is known to be one of the best transportation methods to view the scenic beauty of the Thar Desert and the city of Bikaner. Camel rides are comfortable during the months of March and September as it is less sunny. Camel safaris provide a good source of income to the local residents of the city. Each ride costs around $25 to $30 which may vary according to the type, distance and time of the safaris. Majority of the people enjoy these rides as it is possible to obtain a pleasant view of the local rustic villages. It is also possible to obtain a view of the routine lifestyles of the rustic villagers. Most of the tourists enjoy the rides through narrow lanes which brings them closer to the real life of the villagers in Bikaner. Camel safaris in the city of Bikaner are quite popular as these rides can be customized according to the requirements of the customers. There are short rides or safaris. Long safaris can be arranged from 7 days to 15 days. These safaris can be quite expensive. The price rates of different types of safaris vary accordingly. There are different organizations that offer package tours to the Thar Desert in the city of Bikaner. Customized group safari and individual safari tours are offered to the customers. Tourists can also view a number of tribal people in the village which include the Bishnoi and the Jasnathi. Tourists can also view the eco-system of the Thar Desert while trekking through the desert. There are luxurious campsites in the premises where all the luxurious facilities are made available to the tourists. These campsites also include cultural performances and extravagant banquets. Tourists on camel safaris can observe the simple lifestyles of the villagers. It is quite easy to spot women carrying water pitchers, thatched roofs, mud houses, narrow lanes, spinning wheels and so forth. Tourists can also view the magnificent palaces, the ancient temples which reveal the artistic magnificence of the craftsmen, the deserted forts in the city while experiencing the camel safaris. Although there are a variety of tourist destinations in the city of Bikaner, the camel safari is one of the most memorable experiences.